Bolumu, Beseri Bilimler Binası / B103). It will be in English and is open to everyone who is interested. ABSTRACT: Despite a large amount of genetic overlap between humans and other primates, the expansion of the human brain is both substantial and remarkable. Two interrelated evolutionary developments might have provided the selectional pressures that resulted in our enlarged brains. One is the increased complexity of the social organization in human tribes. The other is the emergence of an intricate and open-ended communication system: language. 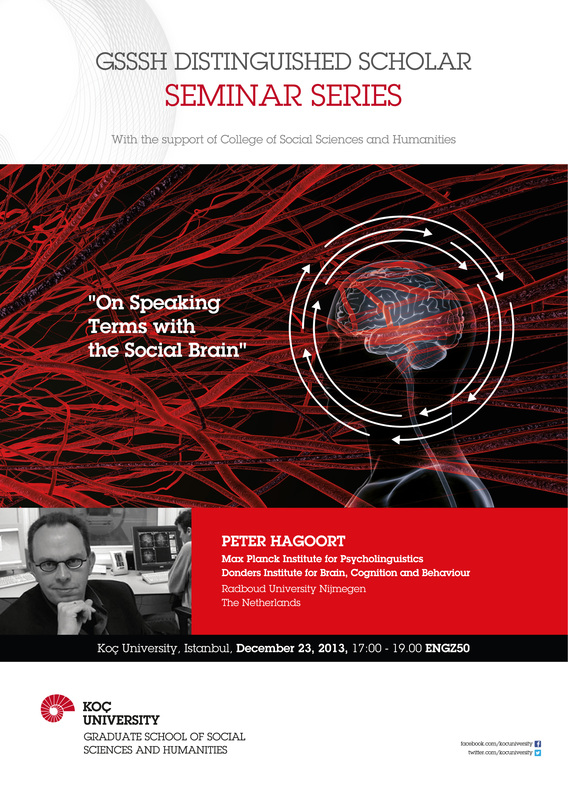 I will discuss recent evidence from brain imaging that provides insights into the psychological and neurobiological infrastructure for our social behaviour and for human communication. I will show that social conformity in humans is regulated by dopamine in the reward system. I will also show that inferences about the intentions behind the exchange of linguistic utterances depend on the Theory of Mind network in the brain. Moreover, the brain measures indicate substantial individual differences, explaining why not all humans are equally equipped with social and communicative skills.